In this week’s Podcast episode, I talk all about my recent decision to switch my hosting recommendation from Bluehost over to Webhosting Hub. It was NOT a decision that I took lightly, but with all of the info provided in full detail in the Podcast episode, it is definitely the right decision and one that I’m happy to bring you today. Large multi-day outage experienced by community member Jeff with Bluehost, with no resolution, resulting in entire loss of website and data. My own bad experience with Bluehost customer support, with a support case being submitted on Jan 19th, with no response until Feb 17th. Recently becoming aware of multiple similar complaints from members of the Smart Passive Income FB group this past week. It was brought to my attention several weeks ago that a community member and long time Private FB group contributor, Jeff was having problems with his websites hosted on Bluehost. His sites were down initially for multiple hours, which turned into days and despite having paid extra to have them take regular backups, he was unable to recover any of his data through Bluehost. “I’ve tried niche sites on and off before without much success. I decided to give it another shot. I went with Bluehost as my hosting provider: their price was reasonable and they came widely recommended. For the past few months, I’ve been slowly building up my primary niche site Defeat Debt Collectors. I picked this niche, regardless of the competition, because I’d gotten myself out of tens of thousands of dollars in debt in just a few years — so I felt I had something of value to add. A few weeks ago, my niche site went down hard. I had a site full of articles and what I got instead when the page loaded was just a prompt asking me to install WordPress! Lovely surprise, no? Outages happen; I wasn’t too worried. I reached out to Bluehost and asked what was going on. They said it was “a known issue” and they were “working on it,” but had no ETA to give. Satisfied all would be well *eventually,* I went on about my day. It soon became clear that their (air quotes) “support staff” had no real idea what the true scope of the situation was. I reached out to @BlueHostSupport Twitter to see if they could help — no such luck. Unfortunately, Bluehost had the *only* real backups of my site. You see, I paid Bluehost *extra money* to perform backups for me so that I didn’t have to worry about it. I had *one* final option to get *most* of my site content back and I took it. I ended up scraping Google’s cache of my site to get a copy of the *text* of each of my site’s posts. That didn’t get everything: there were some new posts that hadn’t been indexed yet, and I had 4-5 pillar articles in the 2,500 word range that hadn’t been published yet. Yeah, I had to rewrite all of that from scratch. Also, trying to get images from Google’s cache was hit-or-miss, mostly miss. On the Private FB group, Chris recommended recommended I try Webhosting Hub instead. I’m happy to say they have been quite accommodating and helpful in the transition. My hosting bill is in the same ballpark as before, but *my site is much faster* in its new home. I’m very happy with my site’s new home and I now make my own *daily* backups with the UpdraftPlus plugin, which drops backups to my Dropbox account. If anything should happen, I can recover in an hour or two, instead of several days. Excellent breakdown by Jeff and I’m grateful that he was willing to share the full details with us today. In addition, Jeff is working on a post to provide the specifics of exactly how he was able to retrieve a good portion of his data from cached Google content in the near future. Looking forward to it. I submitted a case with Bluehost support on Jan 19th of this year, mentioning that I was trying to manually install a premium WordPress plugin and was unable to do so. I instead installed the plugin on a site over on Webhosting Hub, had no issues and evaluated the plugin a week later and forgot about it. Several WEEKS later on Feb 17th, I received an email reply saying sorry for the delay, but go ahead and try it again?! I had completely forgotten I even submitted the case at that point. I guess better late than never applies here, but that is a bit ridiculous. 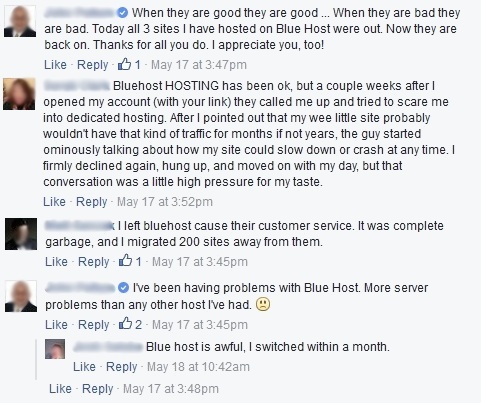 I was watching the comments on Pat Flynn’s first FB Live post this week and noticed lots of folks were commenting about their negative recent experiences with Bluehost. I grabbed several of the comments and included them here, which really hit home that the experiences that Jeff and I had recently were not isolated incidents. I don’t take my recommendations on the site lightly. It is my reputation on the line if I make a recommendation and customers have a bad experience. Once I had all the facts above, it was a much easier decision to make and one that I feel very good about. My new recommendation going forward is Webhosting Hub. That is where this site and all of my other primary sites have been hosted all along, for the last 4+ years. The main reason I switched my recommendation to Bluehost a year ago was because the name was a bit more well known and I thought based on the recommendation of folks like Pat Flynn, that it would have stellar support and service. Obviously, that was not the case. I’ve been a very happy customer of Webhosting Hub during these past 4+ years and it wasn’t until trying out Bluehost that I realized how good I really have it. In this case, the grass is definitely not greener on the other side. In addition to their excellent, responsive customer service that I mentioned in the Podcast, I also was able to speak with their affiliate manager Daniel and talked him in to providing a discount specific to the Niche Site Tools audience of $1 off per month, for the entire length of your initial sign-up. When you go through my affiliate link, you will arrive at the page shown below, welcoming you specifically as a customer of my site, so that you know you’re in the right place and getting the special discount. 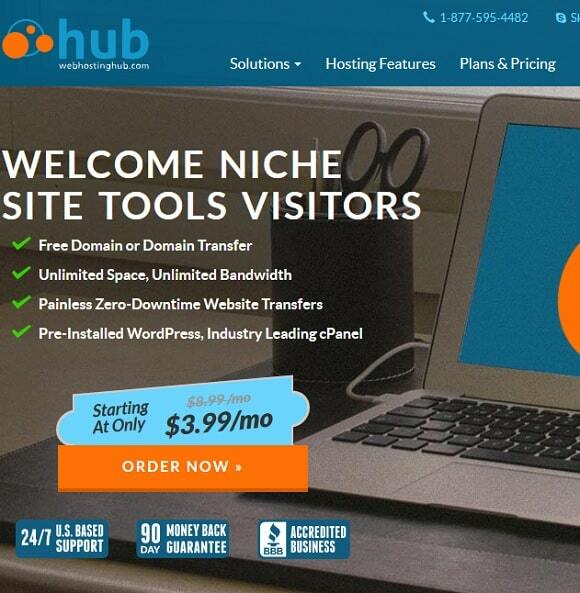 At Webhosting Hub, in addition to the standard features like free domain name, unlimited space/bandwidth and 90 day money back guarantee, they also offer several features that you usually don’t find at these low prices. One of those features is free SSD storage. What that means is your site will be running on the latest in storage technology, with no spinning/moving parts. That means your sites will run quicker and be more reliable than the vast majority of sites out there in the shared hosting space. Jeff noticed the speed increase of his site right away, as mentioned above. For anyone considering a switch away from another host, Webhosting Hub provides free website transfers, making the switch a fast, simple and seamless process. In addition, they provide an optional website builder that can provide a helping hand to newbies as well as the option to have your WordPress site pre-installed for you. 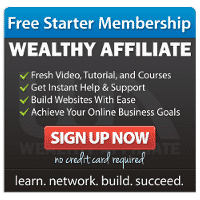 Those are several bonus features that I really wanted to highlight, in addition the exclusive pricing discount you’re getting by being a Niche Site Tools community member and going through my link. For folks just starting out, I definitely recommend the Spark plan. That will provide you with everything you need to get 2 websites up and running, for only $3.99/mo for the 3 year plan. If you know that you want to build more than 2 websites right from the start, or you would like to transfer from your existing host over to Webhosting Hub and already have more than 2 sites, you would be best serviced going with the Nitro unlimited plan at only $5.99/mo for the 3 year plan. 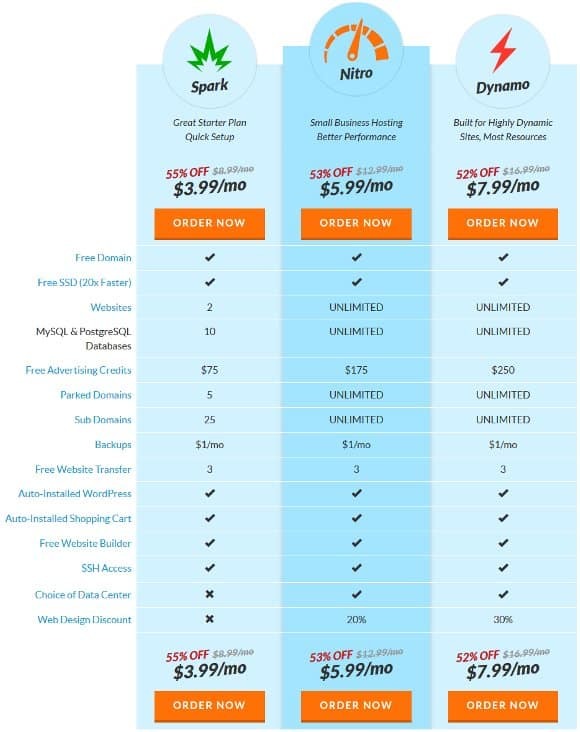 The Dynamo plan is for folks that need a bunch of extra horsepower or bandwidth. This would be someone that has a very well established site with lots of traffic and demanding needs for hosting resources. Most folks will not need the Dynamo plan, but the good part is that it is there, if the need arises. If you have any questions whatsoever, don’t hesitate to ask. You can leave a comment below or reach out to me directly via my contact page. As I mention, I’ve been a very happy Webhosting Hub customer for the past 4+ years and I can probably answer just about any question you might have or point you in the right direction. 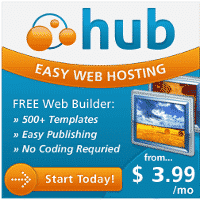 You’ll be in good hands with Webhosting Hub and I’ll be right there with you along the way. As I mentioned on the Podcast, the folks at Thrive will be pre-launching a new product entitled Thrive Ultimatum later this week. Be sure to check out my post from last week with all the Thrive Ultimatum pre-launch details. As new information becomes available, I will be updating that post with all the details. The folks at Thrive are really putting out some quality WordPress themes and plugins. I’ve heard great things from others about Thrive Themes, I’m a customer of their Thrive Leads product and as such, I am really looking forward to checking out their new product. I will also be sending the full details, once I have them, to subscribers on my email list. Be sure to sign-up so that you don’t miss out on the pre-launch pricing, which will only be available for a short time, after which the price is expected to double. In the post above, I attempted to provide a good summary of what was mentioned in the Podcast Episode this week. To get the full breakdown, I definitely recommend you listen in and then come on back. I couldn’t be happier with my decision to recommend Webhosting Hub as my preferring hosting provider of choice and I hope many of you can take advantage of their excellent service, support and my great discount as well.